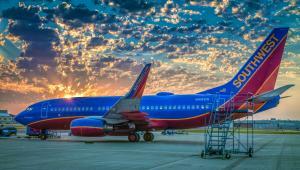 This Southwest Airlines plane is call, "The Winning Spirit". I was fortunate enough to capture a great sunrise over the plane along with some colorful clouds. This photo is on display (floor to ceiling) in a conference room at Southwest Airlines Headquarters.